George DEW and his wife, Jane HILLMAN were both born in Westbury, Wiltshire. This was George's second marriage. His first marriage to Charlotte Watts took place in 1840 from which there were three surviving children; Job, Eli and Hannah DEW. In the 1851 census there are just these three children and the family is living in Dilton Marsh , Westbury, Wiltshire. By 1857 George and Jane have two children by their own marriage, Albert and Emily. It was at this time that the family took advantage of the free passage offered to the new colony of South Australia, and found passage on the vessel MARION, arriving in Port Adelaide on the 19th of January 1857. Also onboard the MARION were Jesse DEW, his wife Ann ADLAM and their six children from the same villiage of Dilton Marsh in Wiltshire. In 1857 Queen Victoria's 63 year reign of the Bristish Empire was already 20 years old and the fledgling 'free' colony of South Australia was also just a little over 20 years old. It had a growing population of 109,000 and was now the major producer of wheat in Australia. The Adelaide to Gawler railway was opened in 1857 and the right to vote, granted to adult men in 1856, was able to be exercised in the states first elections of both houses of parliament. South Australia had lost a great number of its early colonists to the Victorian goldfields during the 1850s but some of these fortune seekers were now returning along with new colonists from England and Germany etc. as well as a steady trickle of settlers from the older colonies of eastern Australia, Tasmania and New Zealand. Later miners were encouraged with generous grants to move, or return, to the labour strapped South Australian mines such as Moonta, Burra, Kapunda and Wallaroo. Members of our DEW family who became miners later moved to settle and work in the new mining towns of Western Australia such as Pingelly, Narrogin. Soon after George DEW and his family's arrival in South Australia, a son, William George DEW, was born on the 6th of June 1858 in Chain Of Ponds, South Australia. We know from birth records that at this time there was another DEW family living in the Chain of Ponds area who were also from Dilton Marsh, Wiltshire. This was the family of James & Fanny DEW. James was George's younger brother who had immigrated with his wife Fanny in 1851. 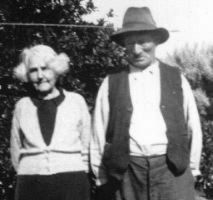 James and Fanny DEW eventually moved their family further north to settle in the Burra area of South Australia. Apart from the Dew families mentioned above, there appears to have been only one other Dew family in the early Pioneer years of South Australia (1837-1900). This was the family of George Dew & Dinah Pomeroy who arrived in 1840 with their infant daughter Ann Elizabeth on board the BABOO. While the other three Dew families all came from Dilton Marsh, Westbury, Wiltshire, George and Dinah Dew were from the Salisbury area of Wiltshire. They settled in the Adelaide area of South Australia, where their three surviving sons also married and raised their families. The details of this Dew family are recorded on a separate Family History web page on this site in the hope that a visitor will recognise them and contact us. We do not know what relationship Jesse DEW had to George DEW, (brother, cousin, uncle etc) or if Jesse and Ann DEW were also in the Chain Of Ponds area during 1857 & 1858 at the same time as George Dew & James Dew. Jessie & Ann had no further children after arriving in South Australia which makes their movements in the earlier years difficult to trace. We know from the MARION's passenger list that one of George DEW's children, Job DEW, appears as a member of Jesse DEW's family. Why this should be is not clear, but it may have been for economic reasons. The Emigrant Regulations of the time stipulated that adult emigrants, children up to one year and those over 15 years were given free passage. While a charge of three shillings was to be paid by the parents, friends or parish, for each child between the ages of 1 year and 15 years. These DEW families all seperated soon after arrival in South Australia. While George and Jane DEW moved to the Borossa Valley area, settling in Cockatoo Valley and James took his family to Burra, Jesse and Ann DEW travelled south with their six children to settle in distant Mount Gambier near the Victorian border. There is some evidence, however, that the families remained in contact, particularly as far as Job DEW and the family of Jessie DEW are concerned. Like many new colonists, George DEW left his old trade, that of weaver, behind to became at first a farmer in Cockatoo Valley near Gawler, South Australia. Later the family moved to Salisbury, George becaming a greengrocer and shop keeper. He was a very strict Babtist and lay preacher in his local church. The family were not allowed to even cook on Sundays. He died of heart disease in Salisbury, 2 Nov 1883, aged 63. his son Frank registered his father's death that same day. George was buried in the dusty Salisbury Cemetary, South Australia, far from the villages and green fields of his Wiltshire youth. After her husband's death, Jane DEW appears to have moved north to the mining town of Kapunda to join her youngest daughter, Ruth and son-in-law, William HAWKE (related to the family of Bob HAWKE, Prime Minister of Australia from 1983 to 1991). She passed away on the 21st of September 1891 aged 63 and is buried in Kapunda, South Australia. Emma Dew SALEMIN b. 1865 S.A.
William George SALEMIN b. 1871 N.Z. Zella Ellen SALEMIN b. 1872 N.Z. Frank Peter Eli SALEMIN b. 1874 N.Z. George Dew SALEMIN b. 1876N N.Z. James John SALEMIN b. 1878 N.Z. Albert Arthur SALEMIN b. 1880 N.Z. Hannah Dew Dau. 5 Scholar born Westbury, Wiltshire. Photograph taken in the garden of their home in Brown Street, Willaston, South Australia early 1940s.